the watch marks its progress and the pen seals its testimony. Special and personalized printing processes need special treatment. Infrared emitters, UV lamps and systems from Heraeus Noblelight make your printing process efficient. Special and personalized printing processes need special treatment. The ink of ink jet or laser printers need to be completely dried or cured before the printed sheets are passed on for subsequent operations such as stacking, cutting, folding or gluing. Infrared or UV technology is used for drying and curing, depending on the type of ink. 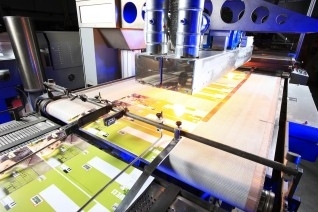 Heraeus Noblelight presents its manufacturing competence in specialty light sources and systems for printing systems at Fespa 2012, in Barcelona, Spain. Learn more about infrared emitters, UV replacement lamps and systems and latest UV LED systems at Hall 3, stand N51. Nowadays, people especially care about the usage of energy resources. That is why it is well worth the effort to examine industrial processes, to examine printing processes scrupulously and find techniques which offer the best results at the greatest possible economical and energy efficiency. The Alito Color Group of Leyton, London achieved significant benefits through one simple change: They replaced their existing drier, which was fitted with near infrared (NIR), short wave emitters, with a Heraeus Carbon Infrared (CIR) System. Carbon Infrared (CIR) emitters from Heraeus Noblelight are especially efficient at drying water based inkjet inks. This is due to the medium wave infrared radiation, which the carbon emitters transfer into the inks at high power. Medium wave infrared radiation is absorbed extremely well by water-based inks. Carbon emitters combine high power and fast response times with the effective medium wavelengths. Following successful tests, two carbon infrared (CIR) were fitted in the existing drier frame. Each 24kW module matches a special 4¼ inch print head. As a result, it is now possible to realise the complete capability of the high speed print heads. Practical usage has shown that the print quality can be maintained even at the high print speeds. In addition, the new emitters require less energy than before and have a significantly longer operating life. This has greatly improved the machine energy efficiency. The emission spectrum of UV radiation is very important for the curing process. It must cause as many photons as possible to react with the coating, on one hand to cure the material completely and on the other to bind the coating with the substrate. Consequently, every curing process is complex and each coating system specifies its own individual curing parameters. For theses individual processes Heraeus develops a variety of customized UV lamps and replacement lamps. This has been made possible through close collaboration with OEM partners, advances in lamp production have been best realized with the aid of intelligent energy supply. A very efficient way to replace lamps at the end of life in digital printing machines is to replace the entire lamp cartridge. Using the used cartridge with just a new lamp is a false economy. The reflector degrades with temperature and becomes less efficient. It is also difficult to maintain the original shape after the old lamp has been removed. A well reshaped reflector could lose 15% of the ultraviolet radiation destined for the ink. So it is obvious that the lamp will need to be replaced again very soon. Second the system contains windows made of a high silica quartz glass. This material has to be kept clean. A small amount of material on these windows will absorb a considerable amount of energy that should be drying ink, not heating up the system. Heraeus Amba offers both replacement components: the complete cartridge solution and quartz glass plates, which allows the customer to replace the entire optical system in the print head of little more than the cost of a replacement lamp. With digital printing, where the lamp, together with the print head, moves over the surface of the print, every little saving in weight and size matters. Innovative UV LEDs have a small shape and allow great flexibility in styling. According to customer specifications Heraeus Noblelight develops UV LED systems matching the machine environment. The individual system components are assembled from a modular construction system. Different sizes of UV LED moduls and wavelengths can be realized. A special integrated micro-optics technology enables the beam to be shaped to optimally suit the working distance required. As a result, almost every special UV LED solution can be manufactured. The system package also includes all the associated peripheral components such as cooling, control and power supply. An important factor governing the operating life of a UV LED is the fact that all components belonging to the system are harmonically matched to each other. With the usage of UV LEDs, energy is saved during the curing process, because LEDs instantly switch on and off. So energy is consumed only on demand, when it is needed, without impairment of the performance of the LEDs. Heraeus Noblelight manufactures UV-LED modules and systems in a complete development and production line. LED chips are processed in so-called “chip-on-board” technology and measured and tested in our in-house, accredited measurement laboratory. As a result, customer-specific system solutions can be assembled for an efficient curing process.